I believe I have a reasonably secure understanding of exposure – i.e. use and relevance of ISO, aperture and shutter speed – and the purpose of and when to use exposure compensation. Nowadays, I use the histogram to act as a guide to exposure – as I don’t have ‘LiveView’ this is a retrospective action when I review the shot on the back of the camera. Nevertheless, I can see what’s going on and can make another exposure if I believe my first attempt is not right. So I’m happy. Recently, I’ve had need to explain exposure compensation and when to use it to a couple of newcomers to photography. Of course, exposure compensation runs hand in hand with the choice of exposure itself and the way metering works on a camera – 18% grey and all that. As I couldn’t find anything that was particularly useful I decided to carry out some simple bench tests myself. It seemed worthwhile to drop it on my blog for reference/discussion. For my first test I set up three black chess pieces on a piece of black card (the card was more charcoal than black but that’s all I had). I shot all the image in RAW, converted to jpg, adding text to help me identify individual pics and a splash of sharpening. I have made no attempt to change levels, use curves or mess with the exposure values in any way. All shots were taken using aperture priority at f/11 – the cameras metering then picked up the first 2 stops shutter speed compensation, then I switched to manual and made the relevant shutter speed adjustment myself (hope that makes sense). Okay. This first shot – no compensation. 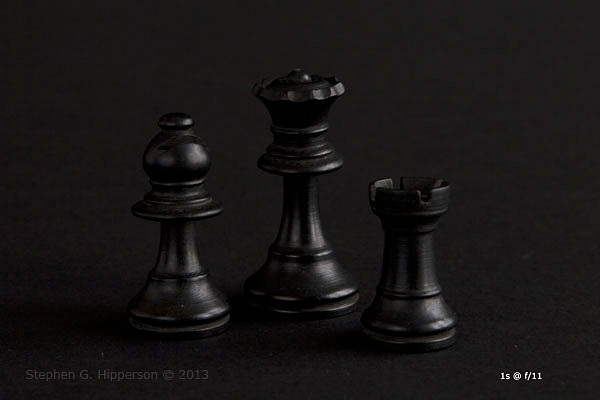 As we can see my black chess pieces look grey and background/foreground is grey. It’s possible that some people may be perfectly happy with this outcome, I’m in no way suggesting there is a ‘right’ presentation. For me, they don’t represent black. If we look at the histogram we can see the majority of the toning is just below middle grey – for things to be black I would expect the bulk of the histogram to be much further to the left. Minus 1 stop compensation, (I have a dial that I can turn to move an led marker to a -1 mark). This, as I’m using a fixed f/11 aperture has the effect of reducing the shutter speed by about half. As we can see, the image is definitely darker and there is definite shift away from the central position in the histogram. Minus 2 stops – another twist of the dial. Now the pieces really do start to look black and there is a significant shift towards black in the histogram. As my camera doesn’t do minus three stops I had to switch to manual and make the adjustment manually. Now the pieces look black and the histogram is really crowding the left hand side of the graph. This one is plus one stop compensation. This one is plus two compensation. I did try 3 stops but two much was starting to burn out. 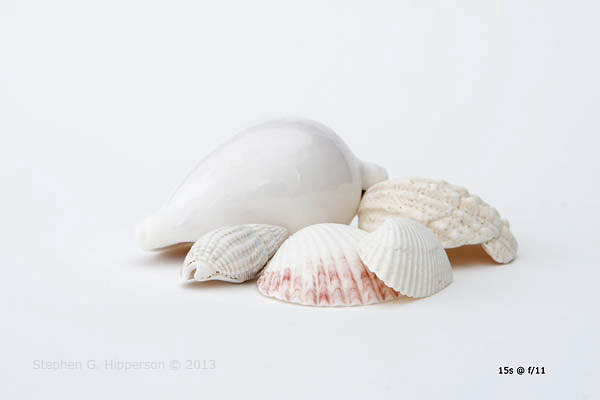 As a complete contrast, I also went for white on white with some seashells on a white card. This first exposure, again at f/11 was with no compensation. A nice grey image – not far from that of the black on black – which is what I would expect as the meter assumes a grey subject. Plus one stop compensation, (longer shutter speed). Everything is starting to go nicely high key and white is getting there. Plus two stops compensation. I think this is about the limit to where I might want to take the image – any higher and I’ll start to lose texture. A brief point, which I won’t expand on here – In most of the photography I do I usually expect to see a black and a white in image, but they don’t have to be there, delicacy can easily be lost by putting in too much contrast. For the black chess pieces, this would be my chosen exposure, i.e. 3 stops minus exposure compensation on that set by the camera’s automatic metering. I ‘final presentation’ I have tweaked the levels a little just to bright the highlights a fraction. This is my chosen for the white on white – plus two stops exposure compensation over the metering of the camera. Again I’ve just tweaked the levels a fraction for final presentation. You may notice significant length of shutter speed that I’ve used – light was from a north facing window and it was snowing outside – a great diffuse light, but not a lot of it! Footnote: I have no idea why but my blog seems to present the same jpg somewhat lighter than the image in photoshop…. not sure what to do about that. Useful stuff. Thanks for taking the time to write this up. Like the chess pieces. A good motivator when one gets bored with the usual routine. Absolutely. Practising technique when it doesn’t matter and where we are in full control of all elements helps when we have to do it for real. Very good demonstration of the the subject. As we discovered in Antarctica, managing blacks and whites in the same frame is especially challenging and presents some interesting choices and trade-offs. Another project perhaps! 🙂 I was chatting on the phone with my father a couple of days ago and the very same idea came up then. Our mutual conclusion was that if the subject/lighting was appropriate use incident light metering. Did you have use of polarising filters, I guess they would help cut glare quite a lot? I love both these images especially the shells. My only critique would be to burn in the big shell on the left as the highlights are nearly blown. Interesting, my camera always set on 0 compensation. only if a quick chimp at the histogram indicates a problem do I add in some compensation. Thanks for the advice on the shell picture. I’ll keep an eye on that but I have stacks of space in the RAW just to pull it in enough if I want – but it was just a test, nothing special. Really found this an interesting read, so much so i’m going to try this out myself. If you’re not familiar with the Zone System I humbly suggest it might be worth looking up the ideas behind that too – probably not worth going through the process, as it’s really designed for film, but I found the underlying principles and ideas particularly helpful, especially in tricky light conditions. With regards to your monitor showing your joegs differently from the web….are you viewing both on the same monitor/screen? Could be to do with your monitors calibration. Just a thought. there’s a world of tips and tutorials on the web, which is what I did. Then tweak your settings in Photoshop etc. Hope this maybe helps, otherwise I have no idea! No, I use the same monitor for everything. I think it’s got something to do with colour management within the browser. I’m using Firefox now and I will use that as my standard for wordpress work from now on. I may have missed it but were you using a matrix, spot, or center weighted meter. Also cameras unfortunately are not necessarily 18% although they say they are in their specs. Your examples of exposure compensation are excellent and pretty much what we teach in our classes. So well done. Histograms which are Jpeg rendering and meters which varies from camera to camera even within the same model are guesstamates. I enjoyed your write up and I know it is going to help a great many photographers who are just learning or relearning. Thanks. I don’t know what my camera manufacturer calls it – but it uses most of the screen. Unfortunately/fortunately, not everyone of the manufacturers sings from the same song sheet – which is great for choice but not so for generalisation. I agree with you regarding histograms/jpgs etc. This blogging business has given me the opportunity to look at lots of pictures created by many whose prime purpose may not be photography as such. To me, some of the images just need a little basic tweaking here and there to turn them into much better images – this is particularly so where people are taking photographs of their artwork and, as it happens this year, snow pictures – examples of both suffering from under exposure where a little tweak in compensation would work wonders. I’m sure you recognise this yourself. Great post, we learned a lot about this during our B&W film classes. Always good to know for BOTH mediums. Did you do the whole Zone System thing when you did your exploration of film?